Earn up to 5,960 reward points. 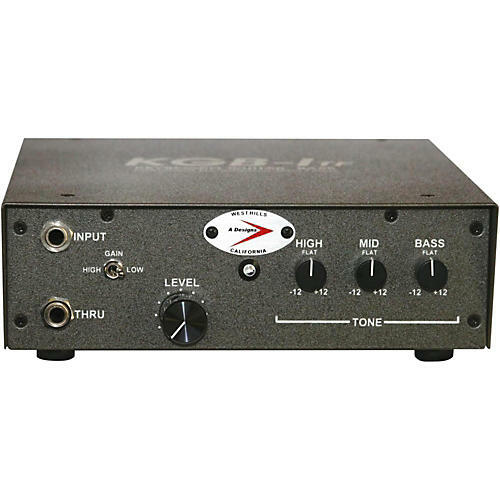 Preamp for guitar and other high impedance signals. The KGB-Itf is a high input impedance, discrete audio pre-amp designed for high impedance, unbalanced signals including guitar, bass guitar and electronic keyboards. Just as a low-impedance, balanced pre-amp is a tremendous benefit for your microphones signal, a pre-amplifier designed for use with unbalanced high impedance instruments is also a critical component of great sound from a high-impedance sound source. The KGB Series contains high voltage, discrete op-amps with balanced output transformers by Cinemag, Inc. The KGB- Itf is a single-channel, solid-state unit that works well with guitar, bass or keyboards. It features an all metal chassis, milled aluminum knobs, balanced XLR gold pin Neutrik outputs, Switchcraft 1/4" input jacks, bipolar electrolytic capacitors, 1% metal resistors, blue LED power indicator, four rubber feet and heat vents, as well as three tone controls for high, mid, and bass.